25th of March (or Independence Day) celebrates independence from the Ottoman Empire. This holiday takes place on the 25th of March each year. People celebrate Independence Day by having large parades. 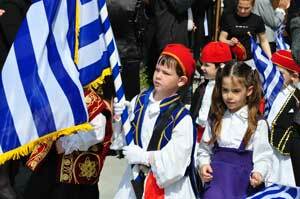 Also many Greeks in the United States celebrate Independence day through parades too. Most buildings are closed however some may remain open. The Ottoman Empire ruled over Greece for about 400 years and then in 1821 the Greeks fought a war for independence. The day the Greek flag was raised against the oppressors was in March.